When did living in America become so complicated? I knew it didn’t bode well, when on a recent weekend in Miami, Sara and I couldn’t figure out how to use the coffee maker in the hotel room, but now that we’ve moved home to Kentucky (after a year in Haiti and a year before that in Vietnam), we’re like Munchkins newly arrived in a land of chrome and touch screens. I’ve said before that Sara and I don’t do “normal” very well, but apparently we do “normal” in the US even worse. We’re not only bad at it; we’re utter and complete failures. I mean, even turning on the television is complicated. 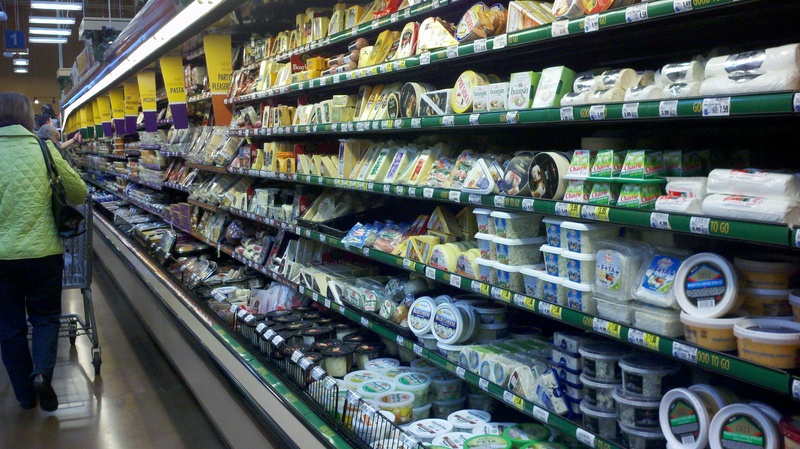 And what’s with all the options in the super market? Have there always been this many choices, even when it comes to onions, napkins, corn flakes, kale? Where's Auntie Em when you need her? I don’t know how to navigate this Yellow Brick Road of endless options, where to get my advanced degree in the science of super markets. So if you catch me, in the coming days, clicking ruby slippers in a “super-store” near you, please be patient. I’m adjusting to an Emerald City that’s perpetually electric, a world that’s wired, a universe of hi-def and digital. This entry was posted in American values, Haiti, home, humor and tagged American values, culture shock, Haiti, home, humor, Kentucky, oz, shopping, technology, Wizard of Oz. Bookmark the permalink. Even though I haven’t lived elsewhere and returned, I am often struck by the mind-boggling array of choices in stores and general complexity about everything. Maybe it’s because I grew up in a world where you had to get up and go over to the TV to change channels or where stores sold clothing items and not a barrage of designers. Sometimes, I stand in the supermarket and I get tired just trying to absorb it all (detergent with beach! detergent with fabric softener! new and improved formula! detergent with color-extend! detergent with built-in wardrobe advice!). It’s all too much. I can’t even image how it must be for you. I was just saying to Nathan yesterday that we have lost something through technology and abundance. I don’t think Americans know how to function with simple choices and simple life, and we are the poorer for it. Thank you for your post! I feel a little less like a Luddite. I have not lived somewhere else and come back either, but the level of options we have seems to have reached epic and totally unnecessary proportions. I’m barely old enough to remember non-remote control TV (though I do remember getting cable when it first came out, and our first microwave oven when they were the newest neatest thing) but I get overwhelmed in the grocery store, shopping for clothes…you name it…in exactly the same way. It’s increasing at a pace that our brains can barely absorb. I can only imagine that any time spent away seems like coming back to a whole new world. Thanks so much for your comment. It just seems to be accelerating at a dizzying pace–worse than it was even when we were home for Christmas. I hadn’t expected to be so overwhelmed by my own country. Crazy!!!!!!!!! I totally agree on the remote control thing. I never thought I’d be one of those cliches–the mom who relies on her kids to know how to turn on the TV–but that’s exactly how it is. Don’t worry, Kathy. As you know, culture shock can take a while. You’ll be “Americanized” again in no time. It’s sick, isn’t it? How much we have, and have available, all the things we “need” to make life easier? Does my tv need more remotes than I have shoes? Well…how can anything be that important that I need to watch it? I pray, beg, wish for “simpler”…less choices…less. I remember coming home to CA from SW GA and all my other overseas travel and meeting some friends at a new shopping mall for lunch. I was overwhelmed with all the “stuff” and actully felt sick at my stomach. I understood better how less developed countries can easily get a misconception (mis?) of N.Americans and what might appear to be our total obsession – “buying things”. Downsizing has been my choice though time has dramatically lessened my awareness acuity. I must say I love my choices of fresh fruit and vegetables. Wishing you patience and fun as you settle in. I felt that way (nearly nauseated) in the grocery store. It was crazy! And it seems the more we travel, the more we accumulate. We also have 66 boxes that will arrive within the next month–we hope. Yikes, Marlene! I feel your pain, Kathy…I used to go into the grocery “superstores” when they first opened about 20 years ago, and forget what I came in for! Jim is a “techno-geek” who delights in confusing me with gadgets…just when I finally learned how to turn on the TV (one remote), change the channel (another remote), and watch a recorded program on the PVR, he changed the system! I have yet to learn how to use the stereo system to play my albums…AARGH!!! How funny, Wendy! And sad the system changed as soon as you figured it out! The curse of technology, as least for me, sometimes! Hope you feel settled soon! I love it that no matter how many times you visit, you are still confused. I’m sorry for you, Tori————————- I think I’ve decided I prefer a smaller store in a foreign language to what I have here. That’s bad, I know! There are days when I find it all too much, too. And I’ve been out of the U.S. so few times that I can probably count it up on one hand. 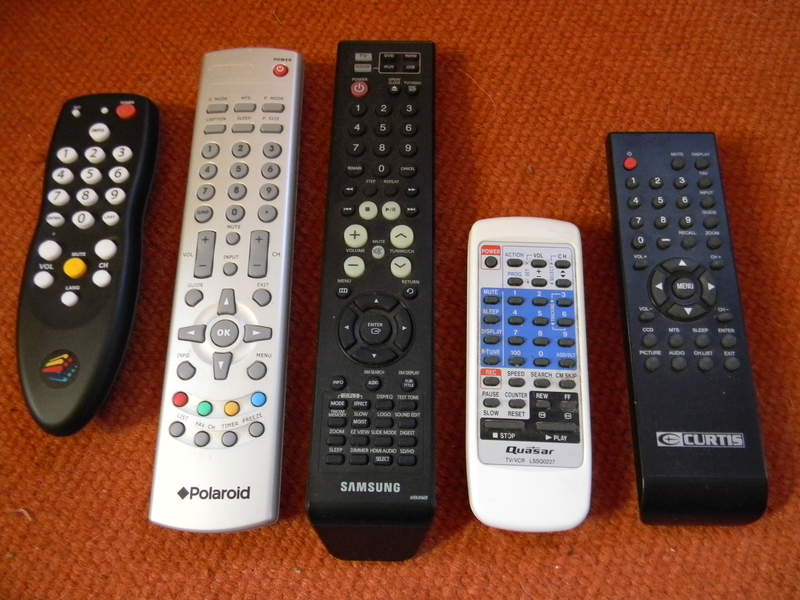 Remote controls… ack! It’s unbelievable how many we have in our home. Most of the time I end up walking over to the stereo or television or whatever to turn it on, off, change the channel or volume, by hand. Love, love, love lifeintheboomerlane’s comment. Ah, yes, the best comment ever–had to laugh at loud at that one! But, I too, do things by hand embarrassingly often, given how supposedly (according to folks like Sara) easy it all is! It’s a crazy world we living in, Robin! Luckily, no matter how newfangled the technology is or how jam-packed the supermarkets are, most places in the modern world (perhaps even Kentucky) offer pockets of respite: farmers’ markets, libraries, independent tea houses and coffee shops, etc. Seek these out whenever you can, and hopefully you can feel just a teensy bit less overwhelmed! It is indeed laughable once I gotten away from the technology that confuses. But really, it is all so complicated–and funny for sure. I can’t wait to visit our local Farmers’ Market–the libraries are a good idea too! Sometimes I stand in the cereal aisle and feel absolutely paralyzed by the amount of choices. I deliberate and analyze and calculate. I mean, it’s cereal!! 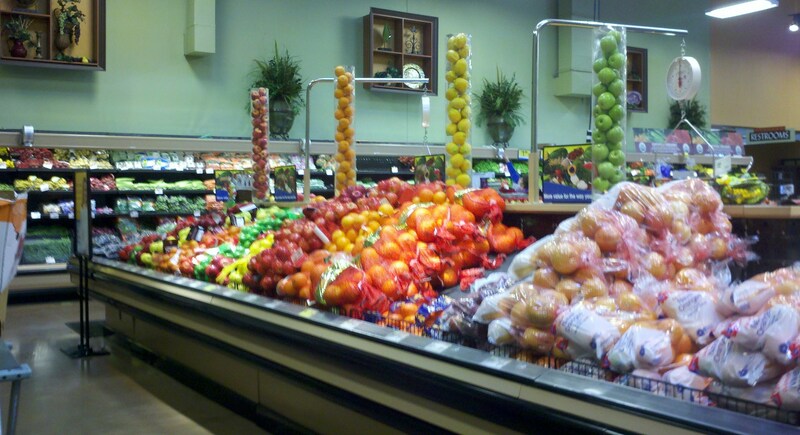 Now I shop in smaller locally owned stores and farmer’s markets as much as possible. It’s simplified things – if I can’t find it there, I probably can live without it. It must be something of a culture shock for you both, Kathy. And choice can often be so overwhelming … hope you don’t have too much shopping to do, or TV to watch! Amen, Sunshine. And, yes, TV is such a shocker! Where did all of these weird reality shows come from? Do you have tons of them in the UK? You know what? You’re right! America is not the land of plenty. It’s the land of over-indulgence. Things change so fast and technology advances so quickly that I can’t keep up with it all, even though I live in the midst of it. No wonder my mind can’t seem to quiet down. Hope you can find a way to tune out some of this chaos.